A portrait done by John Singer Sargent, much like life, is like a box of chocolates: you never know what you're going to get. It was also known as “taking your face in your hands” because there was no guaranteeing that his portrayal would turn out flattering, or that it would even be well-received by the public. Sargent’s Portrait of Madame X, for example, caused quite a scandal when it debuted (it was rejected by the sitter herself) and sent him fleeing the country. Madame X wasn’t the first or last time his creative vision was met with disdain, but despite the high-risk involved, genteel men and women from all over the world took their faces in their hands to sit for Sargent. He was worth the gamble. Sargent's portraiture was honest, innovative, and displayed a distinct familiarity with Impressionism. With Henry Cabot Lodge, it seems that Sargent opted for a more favorable portrayal despite Lodge’s largely unfavorable impact on U.S. politics. Henry Cabot Lodge was a Republican Senator, formerly an author and editor for scholarly journals, who became one of the Republican Party’s most beloved Senate Majority Leaders between 1918 and 1924. 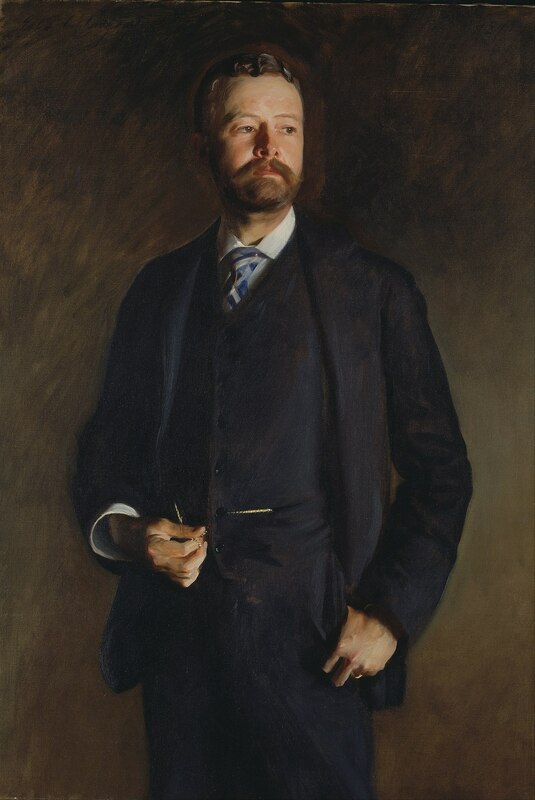 He evidently had no self-confidence issues, coming from a family of extreme wealth and it shows in Sargent’s portrait: he’s standing in his finest suit, striking a full-blown power pose while looking towards a mysterious light source that causes a ghostly halo to form around his immaculately groomed head. His tenure as Senator overlapped with the term of the twenty-eighth president, Woodrow Wilson, Lodge's political nemesis, and lasted the duration of WWI. Wilson and Lodge did not get along, and Lodge did everything in his power to hinder aspects of Wilson’s policies that he firmly disagreed with—you can imagine that this was particularly volatile during a tumultuous political time like, I don’t know, a World War. As Lodge remained in office, his animosity towards Woodrow Wilson began to build and eventually reached a breaking point in 1916 when he made an unsubstantiated claim that the President committed treason through denigrating U.S. policy in correspondence sent to Germany. Wilson was an idealist and staunch advocate for peace; he wanted the United States to remain neutral in the face of WWI and called for “peace without victory” or peace without a winner or loser—he basically wanted to form a truce between European opponents and ultimately keep Americans out of the trenches. Lodge laughed in the face of this plan. After the fighting stopped and the Versailles Treaty (that ended the war) was established, Lodge challenged Wilson once again by convincing a Senate majority to reject the participation in the newly established League of Nations (what later became the United Nations), an international peace organization. He felt that participation in the League of Nations could compromise U.S. authority as a world power. To this day he’s criticized for this rejecting the Versailles Treaty and foiling what would have been a great political legacy for Woodrow Wilson. John Singer Sargent met Lodge during one of his periodic trips to the United States, a rare break from his jet-setting expatriate lifestyle. The successful men would mingle together at social functions, such as afternoon tea parties and “power breakfasts” at the house of Henry Adams (great-grandson of founding father John Adams). Woodrow Wilson’s wife, Edith, recounts in her memoir a peculiar anecdote: Sargent, on one of his trips, was apparently commissioned to paint a portrait of Woodrow Wilson himself, but the night before the sitting he went to a party at Henry Lodge’s house. Lodge allegedly told him that this could be a “great opportunity to serve the Republican Party,” meaning that he should botch the painting on purpose to make Wilson look bad. Regardless of whether the artist intended to do this or not, Edith did not like the portrait of her husband—but, as we know, that’s the risk you take with Sargent. "Henry Cabot Lodge Senate Leader, Presidential Foe." United States Senate. https://www.senate.gov/artandhistory/history/common/generic/People_Leade... (accessed 26 July 2018). Zimmermann, Warren. First Great Triumph: How Five Americans Made Their Country a World Power. New York: Farrar, Straus and Giroux, 2002. Lee Levin, Phyllis. Edith and Woodrow: The Wilson White House. New York: A Lisa Drew Book/Scribner, 2001.